Ballast keeps a boat balanced, so it stays upright. Research acts in the same way for a story, keeping it upright and factual. This article, which appears only here, is part of the research that gives ballast to 1836: Escape to America. ​​In 1836, for the first time in history, the brute strength of human muscle, beasts of burden, and natural forces necessary to propel a craft at painstakingly slow speed was beginning to be replaced by steam power. ​On a steamboat, people could now travel in comparative luxury. They could travel great distances at speeds once thought impossible -sometimes in excess of eight miles per hour! And travel they did. Just over 22,000 non-native inhabitants were counted in areas that are now Wisconsin, Iowa, and Minnesota in 1836 when the original Wisconsin Territory was formed. The majority of these were squatters in the lead-mining region where the three states' boundaries now meet, but this small contingent was about to be dwarfed by the millions to come, about half of them from Germany and many from Ireland. Every other European country was soon represented. By 1850 that number had grown to approximately a half million. And in the next twenty years it exceeded two and a half million people. Minnesota acquired a greater population in twenty years than had New York State in a century and a half. The story of German migration has parallels in migrations all across the world, especially those of the mostly 19th Century Irish and Italian migrations to America, where pull and push factors combine to make people give up more than we imagine, risk more than we remember and work harder than we -- or they -- thought possible. Making a new country is not easy! “[Germans] were diverse in many ways. They included peasant farmers and intellectuals; Protestants, Catholics, Jews, and atheists; Prussians, Saxons, Hessians, and Alsatians; abolitionists and slave owners; farmers and townsfolk; frugal, honest folk and ax murderers. They differed in dialect, customs, and physical features. A majority had been farmers in Germany, and most came seeking economic opportunities. A few dissident intellectuals fleeing the 1848 revolutions sought political freedom, but few, save perhaps the Wends, came for religious freedom…. "Even in the confined area of the Hill Country, each valley offered a different kind of German. The Llano valley had stern, teetotaling German Methodists, who renounced dancing and fraternal organizations; the Pedernales valley had fun-loving, hardworking Lutherans and Catholics who enjoyed drinking and dancing; and the Guadalupe valley had atheist Germans descended from intellectual political refugees. "The scattered German ethnic islands were also diverse. These small enclaves included Lindsay in Cooke County, largely Westphalian Catholic; Waka in Ochiltree County, Midwestern Mennonite; Hurnville in Clay County, Russian German Baptist; and Lockett in Wilbarger County, Wendish Lutheran…. Today, signs of German culture have almost entirely disappeared in America, and this is not just a matter of fading over time. Anti-immigrant sentiment flared in the 1850s with the rise of secret Know-Nothing societies. It was rife before World War I and flamed up again during World War II. After the war, when the concentration camps were opened and people around the world began to grasp the horrors of Nazism, German-Americans were revolted and ashamed. For German culture in America, the twentieth century was a time of severe setbacks--and a devastating blow from which it has never recovered. When the U.S. declared war on Germany in 1917, virulent anti-German sentiment rose across the nation, and German-American institutions came under attack. [ii] Some discrimination was hateful, but cosmetic: the names of organizations, schools, foods, streets, and towns were often changed; people anglicized their names; and music written by Wagner and Mendelssohn was removed from concert programs and even weddings. Physical attacks, though rare, were violent: German-American businesses and homes were vandalized, and Americans accused of being "pro-German" were tarred and feathered, and, in at least one instance, lynched. More than 4,000 German-Americans were sent to prison camps in 1917-18. The most pervasive damage was done, however, to German language and education. German-language newspapers were either run out of business or chose to close their doors. German-language books were burned, and Americans who spoke German were threatened with violence or boycotts. German Shepherd dogs were officially renamed "Alsatians," a designation reversed by the English Kennel Club only in 1977. German-language classes, until then a common part of the public-school curriculum, were discontinued and, in many areas, outlawed. None of these institutions ever fully recovered, and the centuries-old tradition of German language and literature in the United States was pushed to the margins of national life, and in most places, effectively ended. Leslie V. Tischauser says, “The effects of two world wars in a generation, along with the memory of Adolf Hitler, was devastating to German-American ethnic consciousness. 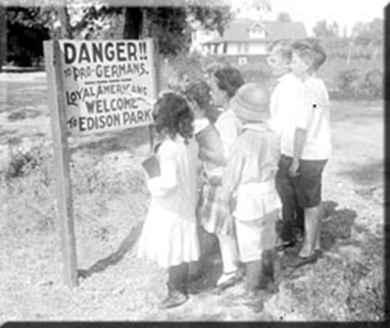 After the second war, what with the new meaning the word ‘German’ had acquired, an ethnic consciousness appeared as something to consign to oblivion, and most German-Americans did just that …. Wounded by WWI, battered by the events of the interwar years, German-American ethnic consciousness became a casualty of WWII, one more victim, however inadvertently and ironically [of war]." Today most German-Americans have never thought of themselves as hyphenated; they are simply Americans, and when they think about it, they are ashamed or embarrassed about any connection with Nazi Germany, even if their own fathers and uncles were in American uniforms during World War II. Many have lost all or most of their family's story of the migration, and some do not even know how their names were anglicized. Their own heritage is blurred or forgotten or even lost forever.